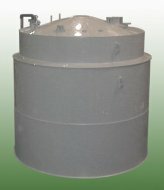 Plastic tanks in accordance with this offer are used in highly corrosive atmosphere. They serve for storing liquid media as pressureless vessels (containers), or the other various process purposes (mixing, blending, dosing, sedimentation, neutralization reactors, reservoirs, galvanization processes, etc.). 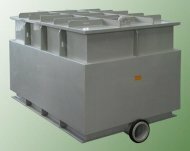 The manufacturer solves the constructional and material design of plastic tanks always individually due to a specific application, according to the method of use, working conditions and with respect to the client's specific needs. 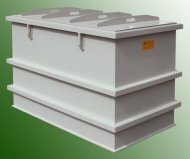 Tanks may be delivered together with a plastic retaining sump. Basic fittings of tanks include technological orifices, manholes, inspection holes, sight glasses and level indicators. 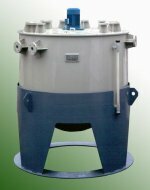 Among accessories belong mixers, clarifiers, heating (cooling) exchangers, pumps, connecting fittings and other components. Electrical accessories are thermo-sensors, level gauges and the other electrical components, or complete electrical equipment including electrical control systems. Additional accessories are ladders, stairs, service platforms and the other components for the safe access in manholes and the other controlling elements of the equipment. We use for production tested plastic semi-products and constructional elements from different modifications of materials: polypropylene (PP), polyethylene (PE), polyvinylchloride (PVC) and polyvinylidenfluoride (PVDF). Working conditions of specific equipment make the main criterion for the choice of the material, always. Technological plastic tanks may be delivered as the individual item delivery, the goods delivery including its assembly, or as a component of the technological unit delivery. We proceed individually according to the needs and requirements of every client in solving each business case. Delivery and other commercial conditions are governed pursuant to the concluded business contract and valid laws. Homogenizing tank is made of plastic PP-H (polypropylene). Square tank is made of plastic PP-H (polypropylene). 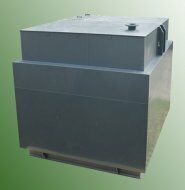 Condensate tank is made of plastic PP-H (polypropylene). 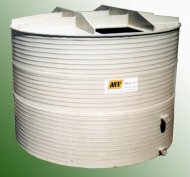 Waste water tank is made of plastic PVC-U (polyvinylchloride). Neutralizing vessel is made of plastic PP-H (polypropylene). 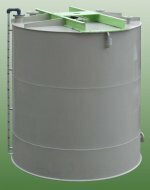 Treated water tank is made of plastic PP-H (polypropylene).